Like most Germans emigrating to the English Colonies in North America during the early 1700s, Johannes came from the German Palatine region through Rotterdam (Holland) on English ships. Later German emigrants would come from Hamburg and Bremen on German or American ships. Most of the immigrants headed for the German-speaking communities in Pennsylvania and New Jersey. Research tells us that Johannes came in one of the later waves of immigrants in 1734. We believe that he traveled to the New World with other families from his hometown. But, where was his hometown and why did he leave? According to our Association Historian, Dorothy Apgar, the Palatine emigration was caused by a combination of local wars, heavy taxes, and harsh winters. The migration was encouraged by the British government to attract more Protestant Germans to pre-revolution America and also was stimulated by the inherent nature of Germans as “risk takers”. 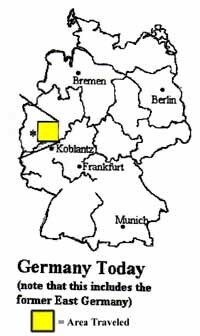 Starting with basic information received from Dorothy during the 1996 Apgar Family reunion, I started my search for the six, close together, German Palatine towns which have old church records mentioning Epgert (or similar) family names.